I’m not sure if it goes back to my college days or what, but it’s just really fun to shoot things. And by shoot I don’t mean firearms; I mean drinks. And by all means, they don’t need to be alcoholic to be fun (I’m more of a wine sipper, anywho)—I’ve been known to shoot pomegranate tea or aloe juice. It’s just fun. So when Bazi asked us to try its “healthy” energy shot, I was game (even if most energy drinks do freak me out). It’s all about trying stuff for you guys! And, again, I can’t turn down a shot. 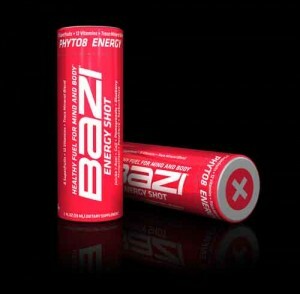 Although the taste of the stuff was a bit like overly sugary Tang, I did like that Bazi wasn’t like other energy shots and didn’t have excessive caffeine, sugar, B vitamins, taurine and other artificial stimulants in it. Instead, the fruit-based formula is made with a mix of jujube, blueberry, pomegranate, goji, mangosteen, raspberry, açaíand seabuckthorn juices and has about 20 calories in its two-ounce serving. I tried my first shot after feeling particularly tired one afternoon, and it did perk me up a bit. Didn’t feel a crash either, which was nice. On another day, I took one before an early morning run, and it definitely woke my legs up sooner than usual. Good to know. I feel the same about energy drinks so I might have to check this one out! Thanks for such a great site! Been taking my Bazi for almost 2 years now and have never felt better. I cant go a day with out it. It really is “healthy energy”.